Bambi (film) Life story of a fawn, Bambi, who grows up, with friends Thumper, the rabbit, and Flower, the skunk, to be the Great Prince of the Forest. But in the meantime he suffers through the death of his mother at the hand of hunters, falls in love with Faline, and barely escapes a catastrophic forest fire. World premiere in London on August 9, 1942; released in the U.S. on August 13, 1942. Based on the book by Felix Salten. The supervising director was David Hand. Voices include Bobby Stewart/Donnie Dunagan/Hardy Albright/John Sutherland (Bambi), Paula Winslowe (Bambi’s mother), Cammie King/Ann Gillis (Faline), Fred Shields (Bambi’s father), Bill Wright (Friend Owl), Stanley Alexander/Sterling Holloway/Tim Davis (Flower), Peter Behn/Tim Davis (Thumper). Includes the songs “Love Is a Song” and “Little April Shower,” written by Frank Churchill and Larry Morey. The film had been put into production as work on Snow White and the Seven Dwarfs was winding down. But the story of Bambi was different from anything else the Studio had ever attempted. It was more serious, and all the characters were animals. In striving for realism, the artists heard lectures from animal experts, made field trips to the Los Angeles Zoo, watched specially filmed nature footage shot in the forests of Maine, and even studied the movements of two fawns that were donated to the Studio. The meticulous work was time-consuming; even taking care to see that the spots on the fawn’s back remained constant meant fewer drawings could be finished in a day. The film moved exceedingly slowly through the production process, but Walt was delighted with the results he was seeing. “Fellas, this stuff is pure gold,” he told the animators. 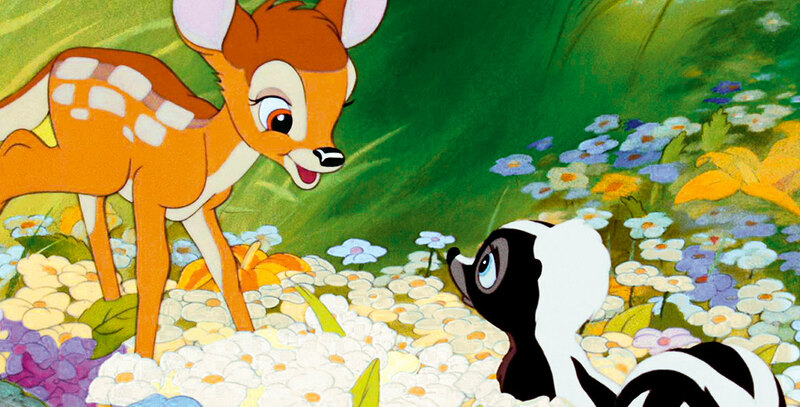 Bambi was released at a difficult time, with the United States deep in World War II, so its initial profits were low, but the story of the little deer coming of age has endured, and today, Bambi is universally regarded as one of Walt Disney’s most charming films. The film received Academy Award nominations for Best Sound, Best Song (“Love Is a Song”), and Best Scoring of a Dramatic or Comedy Picture. 70 min. It was rereleased in theaters in 1942, 1947, 1957, 1966, 1975, 1982, 1988. Released on video in 1989 and 1997.